Usually in well-drained upland deciduous forests, especially beech-maple, sometimes on floodplains. The distinctive papillae (giving the whitish color) can often be best seen on the underside of a leaflet where it has been folded; they should not be confused with the larger glandular-looking dots often seen in the islets formed by the ultimate leaf veins in Fraxinus. Papillae do not occur on young seedlings. A form with the leaves mostly simple was described from Kalkaska Co.: f. barrii W. H. Wagner. 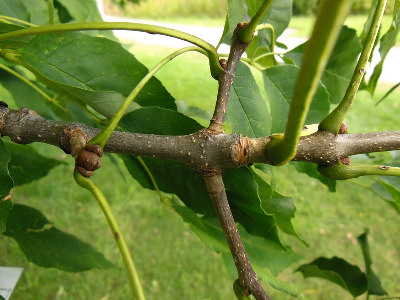 Nesom (2010b) recognizes Fraxinus smallii as a good species, distinguished from F. americana by larger fruits and differently shaped bud scales, and maps it from Van Buren Co.
MICHIGAN FLORA ONLINE. A. A. Reznicek, E. G. Voss, & B. S. Walters. February 2011. University of Michigan. Web. April 21, 2019. https://michiganflora.net/species.aspx?id=1732.